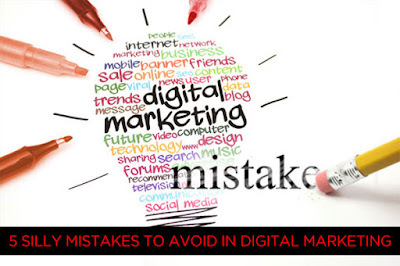 Even though marketing today has evolved and we have learned how to engage with consumers and customers in this connected age, a lot of brands continue to make some terrible mistakes in spite of all the lessons out there. I want to auto-correct the header of this post, first, by saying that these are basic marketing mistakes, and not just digital. Because, as I have said before, 'digital marketing' itself is a bit passé, because, today all marketing is inherently has digital embedded in it. But, we continue to treat marketing in silos, and that's where the problem begins. 1. Calling it digital, treating it as an "add-on"
A lot of brands continue to separate "digital" marketing from "traditional" or "mainstream". That's the big unforced error right there, and that's when it all starts to go wrong. For some marketers, online, social, mobile etc are clubbed together under a separate umbrella called 'digital' and that's a box that needs ticking, so it is like an after thought. It is nowadays a must have, but it's treated like a nice-to-have that's briefed separately, with separate budgets, and different goals. The trick is in briefing every one involved in one go, and starting from a channel neutral perspective. Your 'digital' agency, your media agency, your 'mainstream' agency should all be briefed in together. By the way, a lot of agencies are already integrated in this respect, and we can see why. It makes sense because they are in a unique position to engage the consumer end-to-end. First of all, you do not need to be on every imaginable channel. Specially, on social media, you do not need to be everywhere. Choosing the right social media channels for your brand is key. Even, outside social – brands often launch microsites, create websites (that they might not even need), and then abandon them. Agencies don't usually have a problem doing this for brands – more sites, more pages means more revenue, but it often makes no sense at all for the brand. It is much better to launch across a limited number of viable channels, keep them updated, and be more adept at leading audiences to well-tended social media accounts. If you created an asset for a time-bound campaign, or are about to abandon one because you have moved on to a better one, you need to ensure that the presence on that channel is removed professionally, with attention to all content, and so that someone mislead on to that site or page doesn't get a blank wall to stare at. That's a 404! 3. Not ready for mobile. If your presence is not ready for mobile (or tablet), your brand is not moving. Period. And, no, this doesn't mean having separate mobile .m sites, but having adaptable, responsive websites and blogs. There's absolutely no reason why your page still has to be scrolled across, pinched to expand and read through etc. Your website, your e-commerce gateway, all need to be properly responsive and optimized for the mobile experience. Mobile users are an impatient lot, with 80% of users saying they’ll abandon a site if it takes more than 20 seconds to load. You really need to understand and use the power of mobile for this new 'lean forward' generation. Mobile apps may just be another tool many brands want to use, and the benefits are quite big. Aside from the convenience an app provides to mobile users, there are also push notifications. These messages can be used to maintain brand awareness while also prompting consumers to act upon offers. 4. Gathering and then ignoring data. Or little or no data and insights at all. In today's data-rich, connected marketing world, this is another huge mistake. We have so much data available to us, so much insight possible from that data, that it would really be stupid to ignore that as a key must-do, or to not use the full possibilities of that stream of marketing. Some brands have huge social media presence, but they are totally content with just basic insights like they get free from Facebook. They are simply unwilling, or unable, to dig deeper to get better data, better insights out of their interactions and to listen effectively to what's being said out there. Gathering the right data is key. Some brands do gather a lot of data, but do nothing meaningful with the information and insights they gather. Others – and, sadly, quite a few brands tend to just talk about themselves a lot, without bothering to learn at all. It's not about just getting heaps and heaps of it. It is about having the right people with the skills and ability to understand data and to gain fro it to improve your brand performance both in marketing, but beyond it – in sales, in product development, in strategy. 5. Talking to everybody, all the time. Marketing has never been about talking to all the people all the time. Doesn't work. It used to work a little bit in the old days, but the move has happened today from selling to building relationships, and you cannot engage every one all the time. Starting with clear brand and campaign goals, gathering the right insights about both your target audience and how/where/why they engage – you need to clearly define who you want to talk to. Once you know who you want to talk to, you need to define when and where (your engagement points, your post times, your key announcements) and of course, then where. These definitions do have demographic and geographic targeting elements, but the key today, is behavior. Audiences behave differently on different channels. Every digital communication channel is getting busier and consumer attention is divided and scarce. It takes effort and investment to cut through the noise to get your voice noticed. Don't spread it thin. Focus. Less is more. Personalize, be honest, be transparent. listen, respond, have conversations. Integrate everything you do on line with what you do offline. Be consistent across all your channels – from facebook to your business card and your signage. Your tweet cannot be frivolous while your brand's body language is all very stiff upper lip. And make sure that your brand teams, your marketing teams, your agencies avoid the mistakes mentioned above. They're very basic, but making them costs you a lot. And they are totally avoidable. It's easy. And it's not rocketsurgery. Nice post reminding us of basics to get right. Integrating all of this into the overall marketing strategy is important. Agree that digital cannot work alone. These are fundamental. They are basics, not crucial. I cannot believe that even today some marketing people do not understand this. Of all the points mentioned, we think that getting on every possible social media network, and then not keeping up with content on them, or not managing the community is the biggest sin. Very nice information CheckDeInfo provides Digital Marketing Services and Video Marketing Services.We are providing Digital Marketing Services like SEO,SEM,SMM and Video Marketing Services. Thank you for sharing such valuable and helpful information, tips and knowledge. This gives me more insights on this. I would love to see more updates from you.